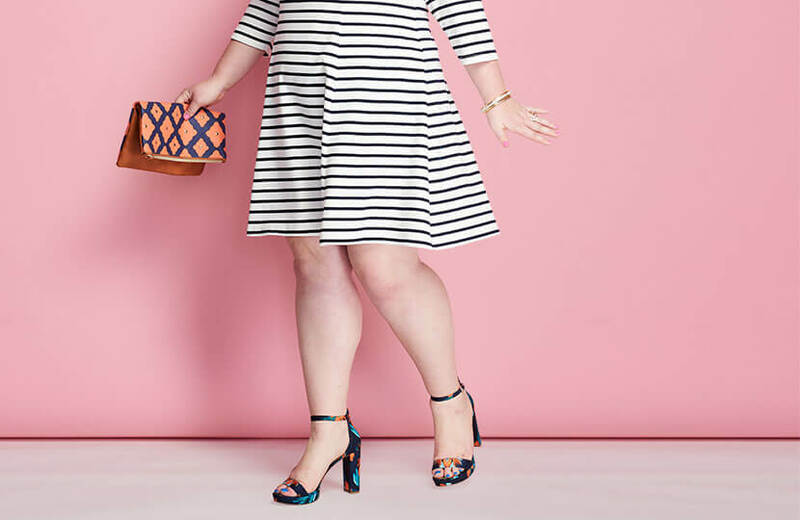 The best dress for you is the one you feel amazing in—but we’ve got the scoop on plus-size dresses to help you find your perfect match. Every woman deserves to have a fabulous dress that makes her feel beautiful. While both women and dresses come in all sizes and shapes, some plus-size clothing silhouettes are complementary to certain figures while others can be trickier to pull off. To help you find the frock that best complements your shape, we’re breaking down the four classic dress silhouettes. Most often, you’ll find that the dress silhouette that works best for you is the one that mirrors your body shape, but remember that while this guide is here to help guide you, each body is unique, and every dress fits differently. Ultimately, the dress you feel incredible in is the right dress for you—regardless of the shape. 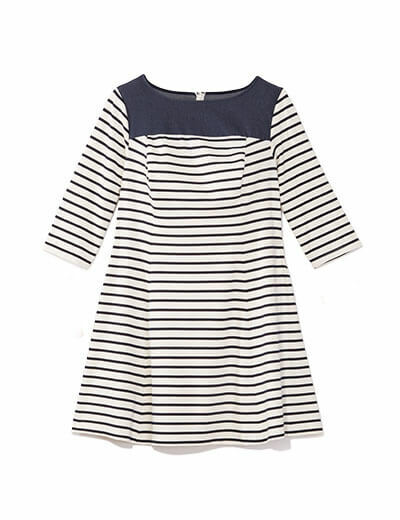 A-line dresses gradually flare out from top to bottom. A-line dresses make the shape of the letter “A”, flaring out gradually from top to bottom. Unlike fit-and-flare dresses that often use pleats or a defined waistline to create a voluminous skirt, the flare on A-line dresses is more subtle. Often, A-line dresses come with or are styled with a belt to create more of a fit-and-flare silhouette and draw attention to the waistline. If you have a full bust and full hips, you may enjoy belting an A-line dress to emphasize your curves and highlight your waistline. This feminine silhouette will give the illusion of fuller hips, even if you don’t have them. The fuller skirt will balance out your top and bottom. A-line dresses can complement bottom-heavy shapes quite well, you just want to ensure that you find the right fit. If you wear a smaller size on top, that’s likely the size you want for your A-line dress, as one in your bottom size will likely be too big for you. Shift dresses have a straight up-and-down silhouette. Shift dresses are an uncomplicated, straight silhouette. There is no flare beginning at the waist, no pleats, and no gathering. The width of the dress is the same at the knee as it is at the bust. 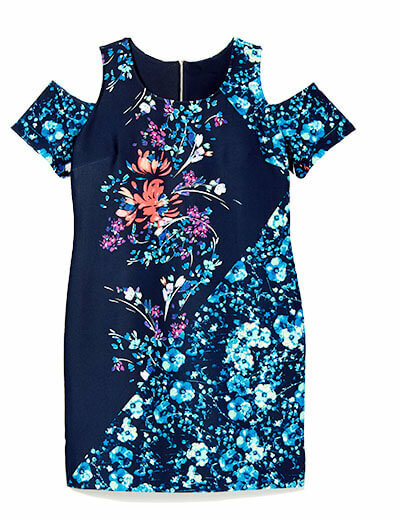 Shift dresses have a boxy fit, and generally, glide over your curves without drawing attention to your bust or hips. Shift dresses are often short, and therefore highlight your legs. If you are top-heavy, you might enjoy showing off your legs and that is exactly what shift dresses let you do. Often hitting at or above the knee, shift dresses glide over your bust, tummy, and hips and highlight those gorgeous gams. Provided you don’t want to flaunt your waistline, shift dresses can look gorgeous on hourglass figures. While shifts don’t emphasize your curves, they will fit your top and bottom the same as long as your bust is in proportion to your hips. 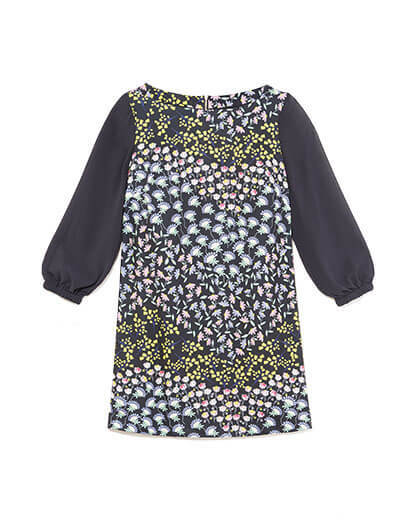 If your bust, hips, and midsection are similarly proportioned, shift dresses will fit you beautifully. Just make sure you’re comfortable flaunting your legs because shift dresses are usually on the shorter side. If you wear a larger size on bottom, your hips might not fit into a shift dress well unless you size up. When you do size up, you may find that the top of the dress looks oversized on your figure. Because this dress is so straight, it can be tricky for bottom-heavy figures to find a shift dress that works with their shape. While we encourage you to try everything at least once, it might be your best bet to opt for a silhouette that mirrors your shape like an A-line or fit-and-flare. Fit-and-flare dresses are fitted through the bust and begin to flare out at the waistline. 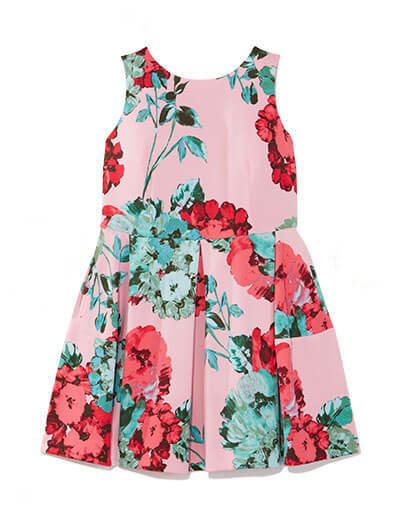 Fit-and-flare dresses do just that: fit, then flare. They are fitted through the bust and then begin to flare out starting at the waistline. They come in many lengths, prints, and materials. If you have a defined waistline and like to flaunt it, fit-and-flare dresses are perfect for you. This dress silhouette mirrors your body shape! While you may need to look for a smaller size, fit-and-flare dresses are a great option for bottom-heavy figures. Make sure that the top fits well, which might require sizing down. The voluminous skirt will make room for your hips and bum while accentuating a feminine silhouette. While fit-and-flare dresses are smallest at the waist and midsection-heavy body types are not, this silhouette can still be a good match. Look for a dress in a knit fabric that has some flexibility in the waistline so it properly fits your shape. Fit-and-flare dresses will give you the illusion of a defined waistline regardless of your figure. Though straight figures don’t have an exaggerated waistline, fit-and-flare dresses can be a great fit to help you create one! This silhouette will make your shape look curvier and may give you an hourglass silhouette. If you’re looking for an easy way to give the illusion of curves, a fit-and-flare dress is the way to go. Bodycon dresses hug your every curve and are fitted from top to bottom. Bodycon is short for body-conscious. Bodycon dresses hug your curves, are fitted from top to bottom, and generally have a good amount of stretch. The catchphrase of any bodycon dress should be, “If you’ve got it, flaunt it.” This silhouette leaves little to hide. Thanks to the stretch in bodycon dresses, your waistline will be highlighted just as much as your bust, bum, and hips. Show off that hourglass figure by wearing something fitted from top to bottom! Stretch can be remarkably helpful when it comes to finding a dress that fits you on top as well as it does on bottom. A stretchy bodycon dress in your top size may work for the bottom-half of you as well. On the other side, you may prefer to get a bodycon dress in your bottom size and the stretch will help the top remain fitted. Flaunt that gorgeous figure! Bodycon dresses generally do not create an obvious waistline the way a fit-and-flare dress does unless the print of the dress creates an optical illusion. If you are looking for a dress that gives off the appearance of a small waistline, floats away from your body, or hides parts of your figure you don’t like to show off, a bodycon is probably not the right dress for you. However, we encourage you to try it before you knock it. When shopping for a bodycon dress, opt for a thicker material like a sweater dress or one made of scuba as those tend to act more like shapewear and will help create a smooth silhouette. If what you are trying to achieve with a bodycon dress is to create the illusion of curves, you might not get away with it if you have a straight figure. Unless the print features an optical illusion, you probably won’t be pulling a fast one on anyone. However, your figure is absolutely beautiful as is and it would be a miss not to try on a bodycon dress. No matter your shape, there’s a beautiful dress out there that will look fantastic on you! If you know the silhouettes that work best with your figure, let your Dia Stylist know. If you aren’t sure which silhouettes might work for you, ask your stylist to send you some options so you can try them on at home and determine your favorites. Once you find that perfect match, be sure to share it with us on Instagram with #MyDiaStyle—we can’t wait to see how amazing you look!